You may well say, Aah, I have seen this sculpture before. That is, if you are a museum buff. Wrong. Allow me to make a confession. I often find myself torn between awe at the cultural treasures with which India bursts at its seams with, and angry at the apathy, neglect and state of degradation in which many lie. I know I am not alone in this conflict. Exactly a year ago I visited the sculpture gallery at Chhatrapati Shivaji Maharaj Vastu Sangrahalaya, Mumbai, formerly known as the Prince of Wales Museum of Western India. Like very many others, I fell in love with one piece. 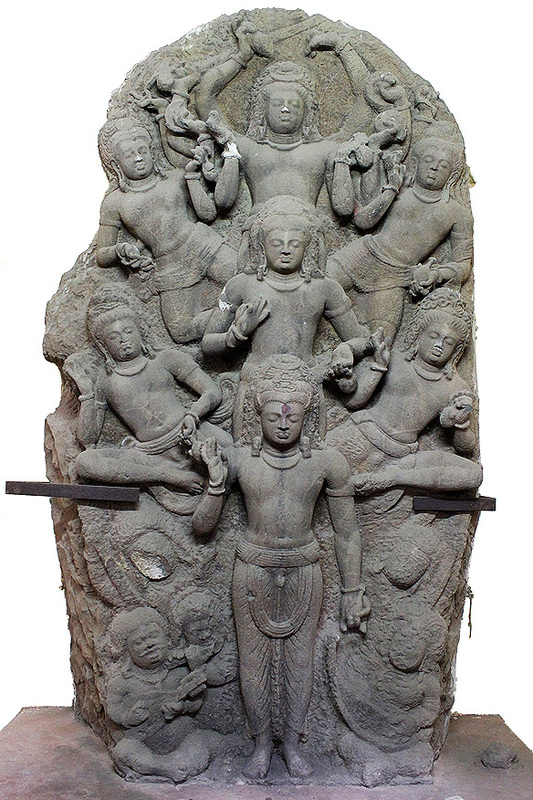 3.06 meters high, the sculpture was a monolithic bas relief of the Hindu god Shiva’s saptamurti form (5th-6th Century) in which six images in various mudras emanate from a central Shiva in sthanaka mudra, devoid of excessive ornamentation and surrounded by five ganas playing musical instruments. Stunning, to say the least. A label on the wall explained it was a plaster cast. The real thing was somewhere in Parel, a neighbourhood in South Mumbai, which I never expected to come face-to-face with. Would you have? I sure didn’t. Then just like that, two weeks ago on one of the heritage walks I often take to unravel my adopted home, I ‘stumbled’—thanks to a well-crafted, researched route—upon the original. I had to blink very many times for the actuality to sink in. As you may well imagine, it was one of those Aah-ah moments in my life! 🙂 It was also one that left me kind of sad and angry. Caged in a tiny, concrete structure in a narrow lane [Mukund Anna Jadhav Road], with bits of cement and strands of cobwebs clinging to it, supported by iron bars, here was a 1,500 year old sculptural masterpiece. The effigy, referred also to as the Parel Stele was found in Parel in October, 1931 when a road was being dug from Parel to Shivadi. Since then it has been enshrined inside the Baradevi temple, Parel Village, and declared a national protected monument by the Archaeological Survey of India. Baradevi means 12 goddesses; a title endowed on the stele by the local villagers who perhaps mistook the 12 figures for goddesses. Seven figures are believed to be of Shiva, as the matted hair and crescent moon indicate, and the other five his ganas or attendants. The label in the museum called it Ashta Shiva. Look carefully and the stele resembles the shape of a lingam, the 8th Shiva. Found in a pile of stone chips, it is incomplete and was never, hence, installed for worship. Historians claim it was meant for a cave or public place as it is too big for a temple. On Mahashivratri, the annual Hindu festival celebrated in reverence of Shiva, large numbers of devotees visit the temple; no rituals take place inside the little room on a daily basis. “You deserve better,” I whispered to it. “I am still being worshipped,” it whispered back. The Parel Queensway walk was run by Bharat, Zainab and Tapan of Khaki Tours. Funds raised from ticket sales were donated to Angel Xpress Foundation, an NGO working on educating slum kids in Mumbai. This entry was posted in Bombay aka Mumbai, Global Travel Shot and tagged Archaeological Survey of India, Baradevi Temple Parel, Chhatrapati Shivaji Maharaj Vastu Sangrahalaya, Classical Indian Aesthetics, Classical Indian Art, Heritage Walks, Hinduism, Indian Sculpture, Khaki Tours, Prince of Wales Museum, Saptamurti Shiva, Sculpture Gallery, Shiva Asthamurti, Things to see in Mumbai by Rama Arya. Bookmark the permalink. Wow, such grand piece! You did great by giving it due credit and putting up an enlarged picture. Loved the way you’ve presented the heptad Shiva Steele in Parel. It was discovered when digging the area to build a new road during the British Raj. They wanted to move the image to the museum but the locals would not let it go and worshipped it as Baradevi in a small structure by the road side. Hence you can see only the plaster cast in the museum now. Wow, I didn’t know about this! It’s one thing to see a collection in a museum, and another to see one right where it belongs. I will go see, thanks a lot! Hi, thank you for the article! I was searching images of this statue and my search brought me here. Thanks also for the good quality picture posted (which I suppose is of the original one and not the copy at the museum)! Thank you! It is exciting for me to see the real artwork in a good quality picture. I am reading (well, devouring is a better word) a book on Indian myths and symbols, and the picture there is rather small and unrevealing. Interesting how the artist left it unfinished. Have a great day!